Pediatric Food Preferences and Eating Behaviors reviews scientific works that investigate why children eat the way they do and whether eating behaviors are modifiable. 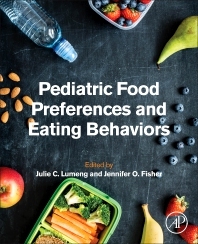 The book begins with an introduction and historical perspective, and then delves into the development of flavor preferences, the role of repeated exposure and other types of learning, the effects of modeling eating behavior, picky eating, food neophobia, and food selectivity. Other sections discuss appetite regulation, the role of reward pathways, genetic contributions to eating behaviors, environmental influences, cognitive aspects, the development of loss of control eating, and food cognitions and nutrition knowledge. Written by leading researchers in the field, each chapter presents basic concepts and definitions, methodological issues pertaining to measurement, and the current state of scientific knowledge as well as directions for future research. Dr. Julie C. Lumeng is a developmental and behavioral pediatrician and Associate Professor of Pediatrics and Public Health at the University of Michigan. She earned her MD (1997) and completed Pediatric training (2000) at the University of Michigan, completed a fellowship in Developmental Behavioral Pediatrics at Boston University (2003), and has been on the faculty at the University of Michigan since 2003. She spends most of her time on research examining developmental and behavioral predictors of children’s eating behavior, particularly as they pertain to child obesity risk. She has been funded by the American Heart Association, National Institutes of Health, and the US Department of Agriculture. She Co-Chaired an NIH Workshop on Infant Obesity, and has served or currently serves on the Editorial Boards of Pediatrics and Pediatric Research. She is an Associate Editor of the International Journal of Behavioral Nutrition and Physical Activity. She serves as the Associate Director of the Momentum Center, a childhood obesity research center at the University of Michigan. Dr. Lumeng has authored or co-authored numerous scientific peer-reviewed manuscripts, as well as book chapters, review articles, and commentaries. She is a frequent invited speaker nationally on the topic of pediatric behavioral nutrition and childhood obesity, and her work has received frequent media attention in international outlets. She is an active member of the Obesity Society, American Academy of Pediatrics, Pediatric Academic Societies, and American Academy of Pediatrics. Dr. Jennifer Orlet Fisher is a Professor in the Department of Social and Behavioral Sciences at Temple University and Associate Director of the Center for Obesity Research and Education where she directs the Family Eating Laboratory. She holds graduate degrees in Nutrition from the University of Illinois (A.M., Nutritional Sciences, 1993) and from the Pennsylvania State University (PhD, Nutrition, 1997). Prior to her appointment at Temple University, Dr. Fisher was an Assistant Professor of Pediatrics at Baylor College of Medicine and scientist at the USDA/ ARS Children’s Nutrition Research Center in Houston. TX. Dr. Fisher’s research focuses on the development of eating behavior during infancy and early childhood. The broad goal of her research is to understand how early eating environments influence child behavioral controls of food intake and health outcomes, particularly overweight. Her efforts focus on the role of the family environment, as a first and fundamental context in which eating habits develop. Over the past decade she has conducted federally-funded observational and experimental investigations of socio-environmental influences on development in appetite regulation in preschool aged children, including studies of child feeding practices and food portion sizes. Her current research focuses on snacking behaviors in young children and interventions with low-income mothers around child feeding. Dr. Fisher has more than 70 peer-reviewed research publications. Her work has received national media coverage by the New York Times, the Scientific American Frontiers series on PBS, and more recently, the Discovery Health Channel. Dr. Fisher was the 2006 recipient of the Alex Malspina Future Leader Award given by the International Life Sciences Institute North America. Dr. Fisher is Co-Executive Editor at Appetite, a scholarly journal dedicated to the study of ingestive behavior and is on the Editorial Board of Nutrition Reviews. She is an active member of The International Society of Behavioral Nutrition and Physical Activity and of The Obesity Society where she has held a number of leadership positions.